This is a new laptop model Lenovo 330-15IGM with default BIOS, you can see BIOS update available on Lenovo's site but I don't want to install it right now because they don't give the option to come back to the previous BIOS version after the installation as I read. 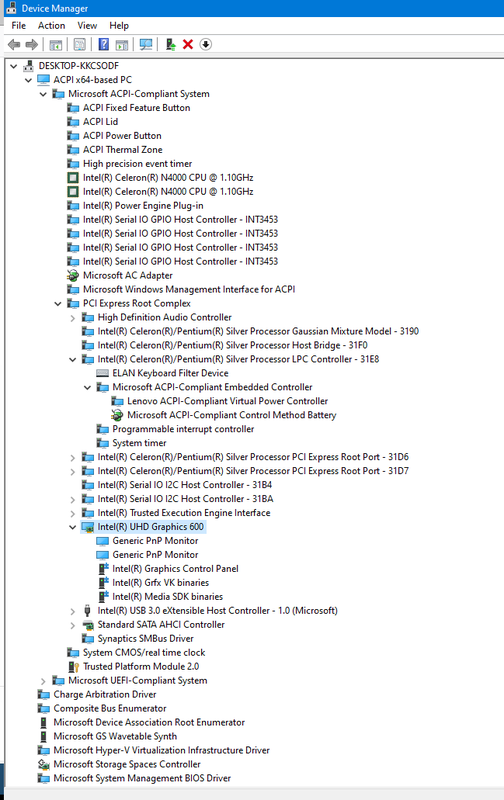 %hs device driver could not be loaded. I'm gonna try with the FeatureScore you posted (after reading about it in the documentation of MS site) looking at this example (https://github.com/bq/web2board/blob/master/pkg/win32/drivers/slabvcp.inf) different driver but an example of how to use the directive in a INF file. 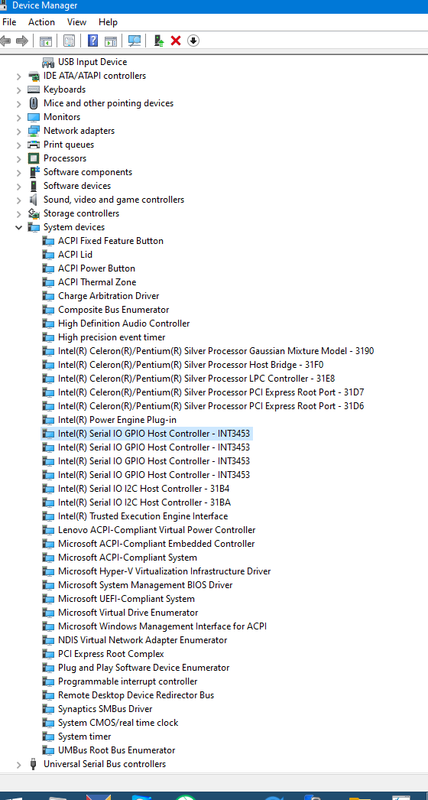 DiskId1 = "Intel(R) Serial IO Installation Disk"
iaLPSS2_GPIO2.DeviceDesc_0 = "Intel(R) Serial IO GPIO Host Controller - INT344B"
iaLPSS2_GPIO2.DeviceDesc_1 = "Intel(R) Serial IO GPIO Host Controller - INT345D"
iaLPSS2_GPIO2.SVCDESC = "Intel(R) Serial IO GPIO Driver v2"
iaLPSS2i_GPIO2_GLK.DeviceDesc_2 = "Intel(R) Serial IO GPIO Host Controller - INT3453"
iaLPSS2i_GPIO2_GLK.SVCDESC = "Intel(R) Serial IO GPIO Driver v2"
What can I do? Windows 8.1 runs very fast on this laptop compared to w10. They have similar IDs but they are different IDs. May you take a look at the .sys file to see if you can adapt it for w8.1 x64 @blackwingcat or somebody in the forum, please? The GPIO Host Controller should not have anything to do with the touchpad or graphics adapter. 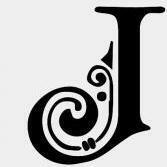 It is specifically for the use of I2C, SPI, UART, or GPIO. It is the type of device that, if this is for home use, you can be safe to not even install the driver for it if you won't use those types of interface in Windows. And, as is the case with some mobile platforms (including integrated systems) that use Intel chipsets, the hardware includes features for devices that are not actually usable. That is, the ODMs do not put the connectors onto the PCB that are required for such things. When you modify a driver, you will break the digital signature on the INF. This will cause problems for modern Windows OS unless you disable the driver signature enforcement. But as stated, even Intel admits that GPIO driver on mobile platforms typically just results in the flag going away, and the hardware being largely useless without the physical connections. Time to get a null (dummy) driver? 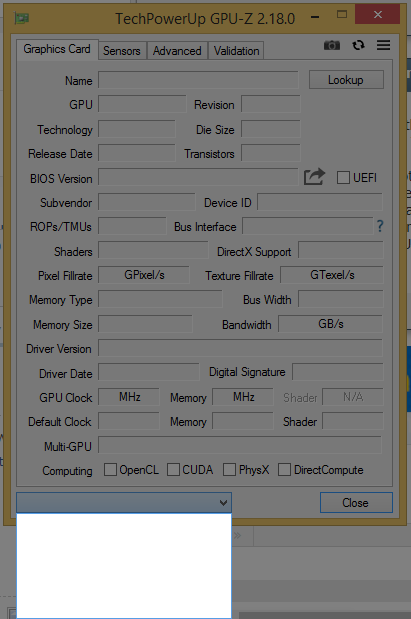 So why the graphics card is not detected on windows 8.1? its an ACPI related question? 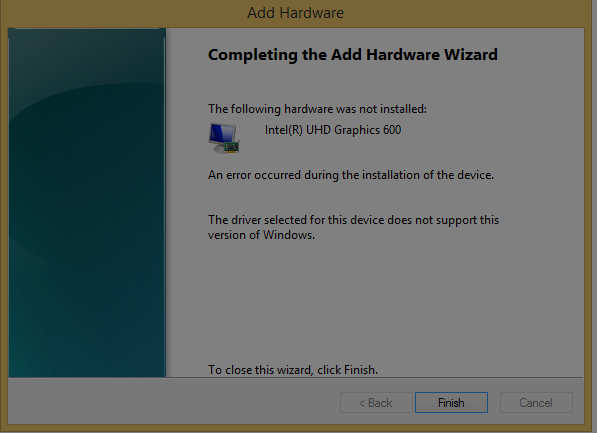 Does the graphics adapter appear for another OS? If so, you can use Device Manager to do a view by connection, to see what parents it has. Windows 8.1 would have the same structure in theory. Yes, I have all drivers installed and working on w10. 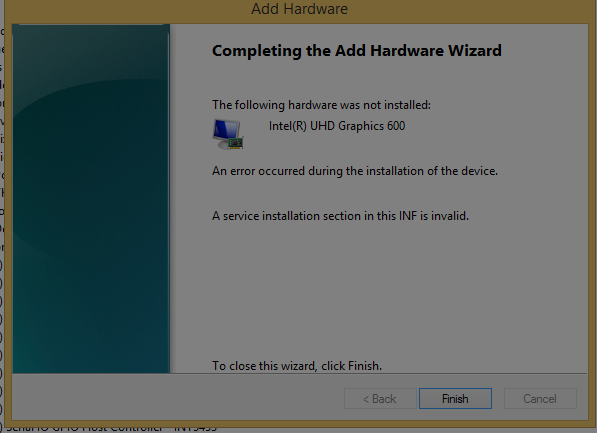 So I need to be sure it is installed and working on w81 or I need to check if this other device has a parent too ? 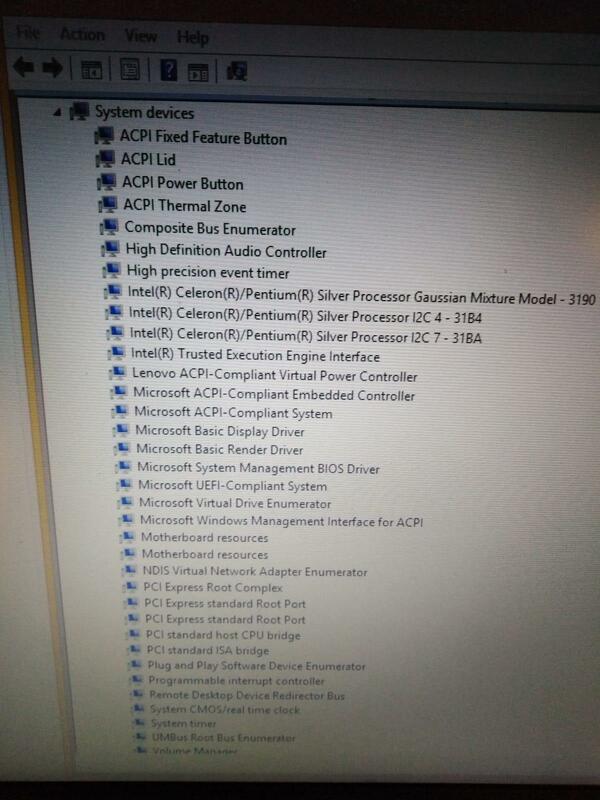 mmmm I'm gonna check for the PNP0A08\0 on w81 now..
Those are all in-box drivers... 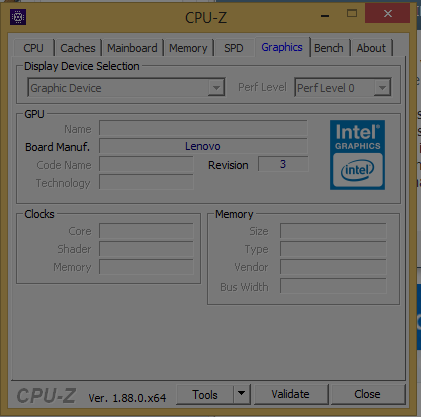 I don't think there would be any change, but you can try installing the chipset driver. I will check 31D7 and 31D6 because the device name is different.. There are two things relating to that. 1. Never have the need to dump the firmware off the system for that. If there is one on the website, it is good enough. Also in my experience, firmware dumps can have too little or too much data in them as compared to ones provided by the manufacturer. 2. I would never attempt such a thing on a regular system, with no promise of replacement. One wrong thing can brick the notebook. I've done that many of times, but they were not a single system and the hardware was replaced. I would say that without a duplicate system to test learning how to do the thing you want properly, it would be very risky in case you end up doing something wrong. Will I have to mod the BIOS? Display\0000 is the wrong ID, I think the driver is going to be useless until the correct device is being made available to Windows correctly. Since the third party programs do see it, I suspect this device does exist in Device Manager, perhaps under hidden devices, as some other thing besides a video controller. Try searching for DEV_3185 in msinfo32. And also, when I go to Components > Display" in msinfo32 there is no information, all is blank.